We have been running a thriving sling library for six years, first as part of a slingmeet, and recently as a stand-alone service based fortnightly at a lovely cafe in a family-friendly venue. But, after listening to the parents who use our library now, we realised that times have changed, babywearing is entering the mainstream, and we could offer a better service to meet the needs of more families. Parents wanted to borrow a sling when they needed it, rather than having to wait until the next library session. And often, people wanted a sling but couldn't get to the venue. Or were working at the time the library was open. Or the library hours clashed with baby's nap-time. Or family life was just too hectic for them to make it on time. There were a million-and-one reasons why people couldn't access the library and borrow the sling they needed. So, our library is now revamped as a super-user-friendly online service. The whole library is available to view online and on Facebook, so you can browse it from home (or work, or on the bus/in cafe/out with friends via Smart Phone or tablet) at your convenience, and get in touch directly with our sling librarian, who will arrange for you to pick it up at a time that suits, or post it out to you, complete with full instructions. Our sling library is at the heart of our community involvement. 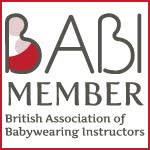 Our purpose is to share the benefits of babywearing as widely as possible. For this reason, we only charge £5 per fortnight to borrow a sling, and we have a broad range of high quality slings, including limited editions, the latest designs and innovations, and hard-to-find, sought-after classics. We add new slings regularly, and have regular polls on our Facebook page to ask our library-users what they would like to see included. To have your say, or to leave any comments or ideas, visit us on Facebook or Twitter.